This Eagle flew far from home. 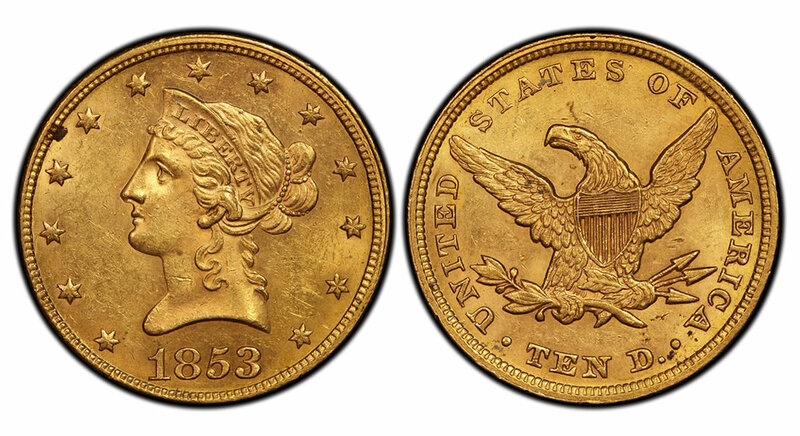 A rare 1853/2 overdate U.S. Liberty Head $10 gold coin was discovered when it was recently submitted to the Professional Coin Grading Service (www.PCGS.com) office in Paris, France. The submitter did not know it was a rare variety Eagle and unknowingly included it with a group of "common" U.S. gold pieces. Discovered in a submission to the PCGS Paris, France office, this rare 1853/2 overdate $10 is graded PCGS MS62. Photo credit: Professional Coin Grading Service www.PCGS.com. The overdate coin is now graded PCGS Gold Shield MS62, the highest 1853/2 Eagle ever graded by the company in its 32 years of rare coin authentication, according to PCGS President Don Willis. "The overdate variety was part of a submission to PCGS Paris by a PCGS Authorized Dealer from Europe who submitted a large group of U.S. gold coins. When the grading room examination began, it was immediately detected as an overdate by PCGS Director of World Grading, Mike Sargent," explained Willis. "Every collector dreams of finding a rarity. Even though they have handled almost every known great rarity, our graders are no different. Everyone in the Grading Room in Paris was very excited to be part of this discovery," recalled Willis. "This goes to show that there are still historic coins out there waiting to be discovered!" Sargent said scarce date U.S. gold pieces are sometimes found in Europe, but "it is quite rare to find a Mint State example of such a rare coin with its natural surfaces still intact. Examples of pre-1860 Mint State $10 gold coins are scarce in any date or mintmark combination, and this particular rarity will surely be desired on the secondary market." 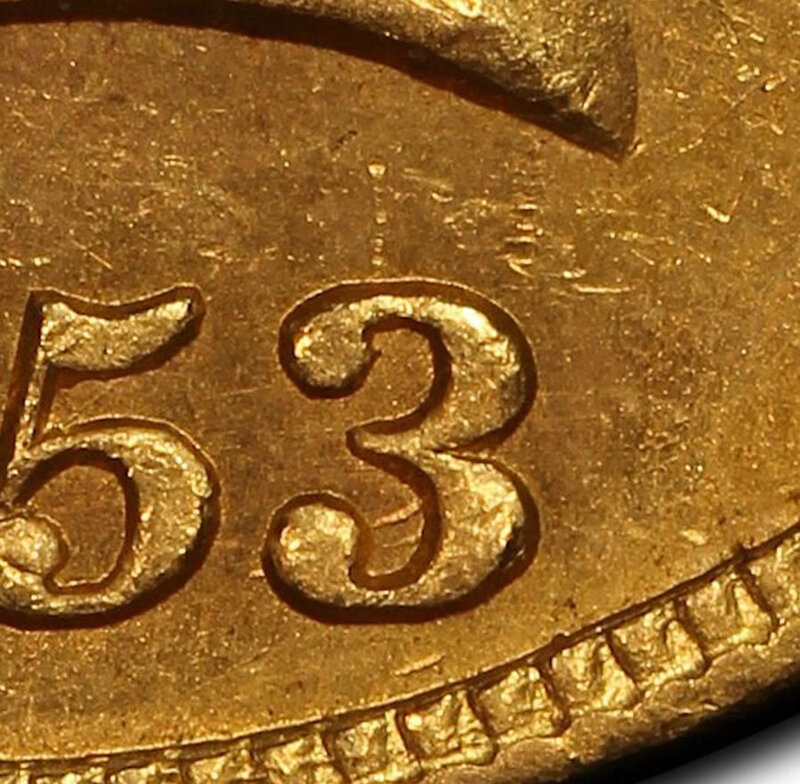 A portion of the number 2 can be seen in the lower loop of the 3 on the 1853/2 Eagle. Photo credit: Professional Coin Grading Service www.PCGS.com. PCGSCoinFacts.com, the internet’s most comprehensive resource for information about United States coins, points out that the 2 in the 1853 over 2 variety "is quite faint and easy to miss even on high grade specimens." A portion of the number 2 can be seen as two lines in the lower loop of the number 3 digit in the date. "What the owner originally thought would be a half-ounce gold coin worth perhaps a little more than it’s weight in gold turns out to be a rare coin worth tens of thousands of dollars because PCGS experts recognized it as a desirable variety," said Willis. "It shows once again that PCGS helps maximize the value of your coins while providing the greatest liquidity." Since its founding in 1986, PCGS experts have certified over 38 million coins with a total market value of over $33 billion. For information about PCGS products and services, including how to submit your coins for authentication and grading, visit www.PCGS.com or call PCGS Customer Service at (800) 447-8848. Information about the PCGS Paris office is available at www.PCGSEurope.com.